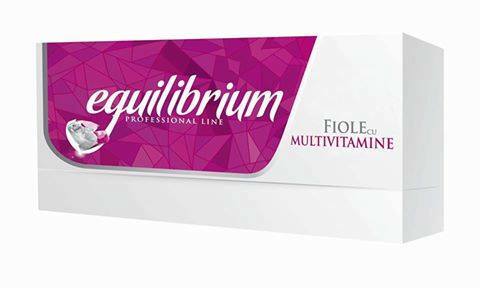 The Gerovital H3 Equilibrium Professional Multivitamin Vials offer an almost instant restoration of the skin daily exposed to radical stress and aggravated by the accelerated and premature aging (stress, pollution, UV, radiations, etc). A cocktail of vitamins A, C and E, in stable forms, enriched with lipoic acid, a water- and fat-soluble powerful antioxidant, capable of regenerating other antioxidants in the skin, such as vitamins C and E. Vitamin C, present in a very stable derivative form, penetrates skin more effective than the pure ascorbic acid. The association of the 3 vitamins ensures the neutralization of the free radicals’ harmful effects which favors the regeneration and synthesis of new collagen and elastin fibers. Usage: Recommended in the Oxygenation / Ionization phase of the cosmetic treatment or apply 3-4 times per week, on a clean face, alone or in association with other complementary products. Can be used at the end of the cosmetic treatment, under the face mask. INGREDIENTS: ISOPROPYL ISOSTEARATE, DIMETHYL ISOSORBIDE, UNDECANE, TOCOPHERYL ACETATE, TRIDECANE, THIOCTIC ACID, CITRUS LIMON PEEL OIL, RETINYL PALMITATE, 3-O-ETHYL ASCORBIC ACID, D-LIMONENE, HELIANTHUS ANNUUS (SUNFLOWER) SEED OIL, TOCOPHEROL, HYDROGENATED PALM GLYCERIDES CITRATE, GLYCINE SOJA OIL, CITRAL, BHT.